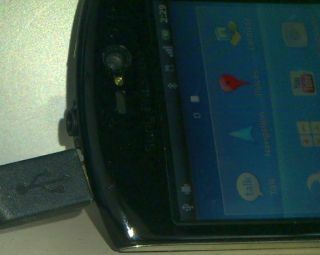 Sony Ericsson Hallon appears in spy shots - Anzu too? You remember a few days ago when TechRadar told you that Sony Ericsson was planning two new devices - the Hallon and the Anzu? Well, spy shots have emerged of phones that looks surprisingly like at least one of them. The first is the Hallon, and fits perfectly with the information our well-placed source gave us - it's a Sony Ericsson Vivaz rebooted with improved hardware (ie a capacitive screen) and Android 2.3. The top of the phone houses the microUSB slot as well as a curved exterior, mimicking the 'human curvature' design of the Vivaz, so it's almost certain we'll be seeing this at Mobile World Congress. The next phone was snapped in China, and while we're waiting for the Anzu to rear its head, it's unlikely that this is the one given the smaller screen. The mystery phone has been tipped to come with a 3-inch screen - much smaller than the Anzu's reported 4-inch effort, and also comes with a superb graphic processing and benchmark score - is this a PSP Phone sidekick? Given Sony Ericsson looks likely to be opening an Android gaming portal called Xperia Play that seems a real possibility - roll on MWC when all these mysteries should be uncovered.